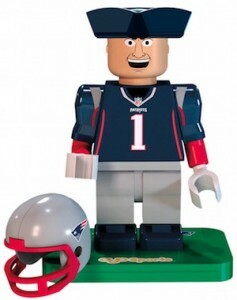 Somewhat overlooked by collectors, mascots maintain a strong fan following, especially among kids, and are once again covered as 2015 OYO NFL Mascots football minifigures. 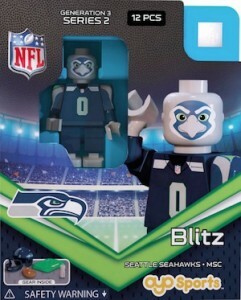 The LEGO-like toys feature the primary mascot for most of the teams in the NFL. Shop for 2015 OYO NFL Mascot Minifigures on eBay. Thanks to their distinct look, the officially licensed figures tend to convey the mascot more clearly than the OYO figures for the players. Each mascot comes with a team uniform, a helmet featuring a removable face mask, cap, football, water bottle and custom display stand. Each stand is individually numbered. 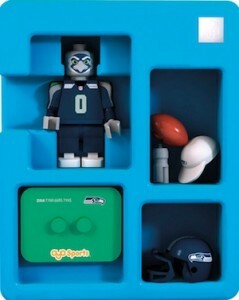 While they can be displayed, the OYO NFL Mascots are designed with playing in mind. The minifigures possess bendable knees and posable arms. 2015 OYO NFL Mascots are part of the Generation 3 - Series 2 release for the league. NFL Mascots were also covered in the Generation 1 - Series 1 product.